We went to Shanty Creek in northern Michigan for a long President’s Day weekend. Although many people were there, we never felt overly crowded and didn’t have to wait in any long lines. Shanty Creek actually has three main areas: Schuss Mountain, Summit Mountain and the back of Schuss Mountain and Cedar River Fillage. We stayed at The Lakeview Hotel & Conference Center at Summit Village with a view of Summit Mountain, ina a hotel room with kitchenette, fireplace and balcony. The kids love having a ton of snacks at their disposal and the fireplace was a warm welcome after skiing. 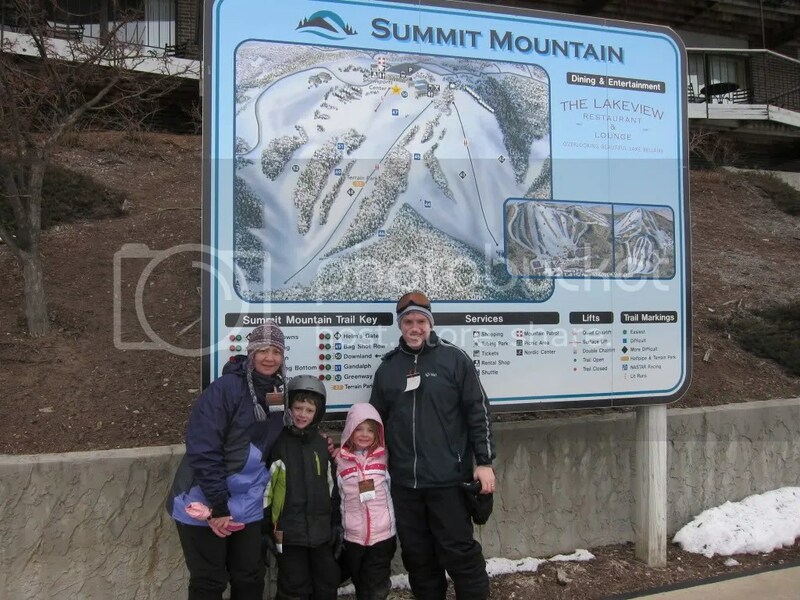 We went to Schuss Mountain first because my daughter likes the magic carpet that we experienced at Crystal Mountain. It was a little busy here due to several classes that were in session but served as a good warmup for all of us to get used to skiing again. The kids got cold pretty fast so we called it a day and went back for some swimming. The indoor pool was heated to a great temperature. At other places we’ve been, heated pools can still leave us shivering, but this pool was comfortable for everyone. We skied out of the back of our hotel and the kids got used to using the tow rope. At first, this area looked daunting because you could keep skiing and go all of the way down the mountain, instead of stopping and turning at the end of the tow rope area. Once everyone was comfortable, we ventured down one of the green-colored hills and rode up the chair lift. The kids prefer the lifts that have a bar in front to hang on to but we used our ski poles across their laps to make them feel secure. My son refuses to listen to his dad and skis like a mad man down the hills, legs flailing and wobbling around until he gets to the tow rope. My daughter was more cautious and so she listened a bit better and took some time to practice her form and stops. The tow rope did chew up the kids’ gloves (and mine) so next time we’ll invest in better ski gloves or bring out the old duct tape. For our last day, we went to the tubing hill, which charged more because it was President’s Day but nonetheless was a great investment. Snow groomed over the driving range, the tubing hill provides tubes and a hook and rope system to pull you in your tube back up the hill. The kids loved going down as a group because you can gain more speed. When my daughter (6) tried to go down on her own, she didn’t have quite enough weight to get all the way to the bottom. On our last run, my son was at the bottom when his hat fell off. When he bent down to pick it up, he was plowed over by another person on a tube, and he ended up with a foot in his face and walked away screaming with a bloody nose. Although we left on a bad note, the overall experience was very positive and the kids were asking when we could go skiing and swimming again. 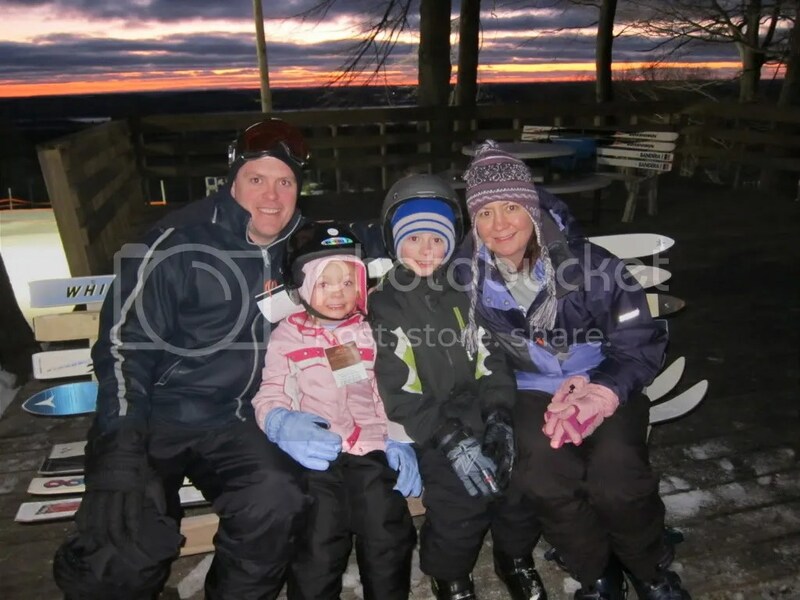 We loved the atmosphere of the family-friendly skiing, swimming, tubing and overall winter wonderland. Poor son! Ouch. Shanty Creek is so awesome…I haven’t been in years, but used to go when I was a teen and loved it. I especially love the family pic with the beautiful sky in the background…GORGEOUS and such a framer 🙂 Thanks so much for linking this to My Michigan Memory!